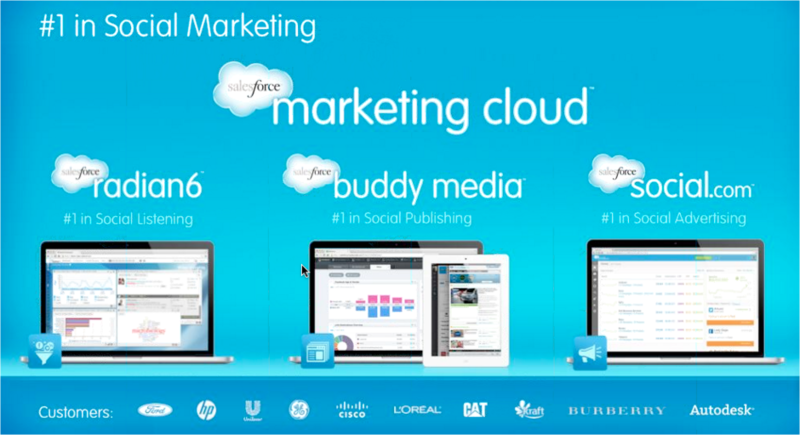 Salesforce.com has evolved its Marketing Cloud suite of products by bringing them under a single domain: Social.com. With this reorganization of sorts, the enterprise software company is launching an advertising service that enables businesses to connect their CRM data with social media in order to put together targeted ad campaigns. With its new Marketing Cloud, Salesforce is giving its clients a new way to engage customers in the social media realm. Prior to today, the CRM company offered users Radian6 for social listening and Buddy Media for publishing — both companies that it acquired over the past couple of years. Today, it throws social advertising into the mix. Under Social.com, a domain that Salesforce bought for $2.6 million about two years ago, companies will be able to create, optimize, and automate social ad campaigns right from within a single platform. No longer will businesses need to jump from Salesforce to Twitter or Facebook to take advantage of social data. In fact, it consolidates everything a company would need to know about their users right within a single database. Creation of social and mobile ad campaigns: Salesforce now enables customers to create and execute social ad campaigns at scale, reaching consumers on any device, whether it be Web, mobile, or on tablet devices. Targeting has also been enhanced so that the right audience is reached based on demographics, conversations, or social interests and activities. Optimization of social ad campaigns: Companies can track and analyze their ad’s performance and monitor what people are saying in order to make any necessary adjustments to help achieve campaign goals. Automation of social social ad campaigns: Just like how Google AdWords is automated for traditional online advertising, Salesforce has applied that to the social space. This service gives its customers the ability to adjust their ad spend by establishing and defining rules relating to real-time optimization decisions. Social advertising is a relatively new space for marketers and brands. Prior to the introduction of Twitter and Facebook, the concept didn’t really exist, but now there are studies that show companies are paying attention to this new opportunity. According to media and advertising research firm BIA Kelsey, businesses are projected to double their spend in the social ad space from $4.7 billion in 2012 to $11 billion in 2017. The reason for the rapid increase, according to Nielsen, is that social advertising offers up massive reach along with a very unique opportunity to target people, not just by keyword, which was standard when running campaigns on Google, Yahoo, or Bing. When a new campaign needs to be created, users can enter in the relevant details in order to begin crafting ads for Facebook and Twitter. With Facebook, users can enter in location-specific targeting info, along with demographics like age, interests, etc. — all standard fields that would be asked through its Facebook advertising interface. The added benefit here is that companies can import customer data sets that they might have within Salesforce to help make the ads more compelling. But what if there is a subset of people within Salesforce that a customer doesn’t have a Facebook account assigned to? According to Gordon Evans, Vice President and Product Manager for Salesforce Marketing Cloud, the CRM data is transferred over to Facebook through an automated process and the social network tries to match up the names in the database with its more than 1 billion users. Evans tells us that the data transmitted is done so in a secure fashion. If there are any matches, those individuals will begin to see the targeted ads within Facebook. Social.com also allows users to create promoted Tweets right within Salesforce in a similar manner. Utilizing Radian6’s social monitoring function, customers can find out when a particular topic is trending that might be relevant to their promotion. So for example, if Twitter #music is trending right now, a company might be inclined to craft a Tweet to be targeted at those searches and users that mention it, in the hopes of being noticed. The new service also comes with a visually appealing dashboard that allows companies to track their campaigns. It displays the common metrics that any agency or brand would care about, including number of clicks, impressions, cost per click, clickthrough rate, and total spend. While users might think that all Social.com is doing is consolidating all of the advertising efforts into one platform, it’s actually a bit more than that. Primarily it’s the connection data gathered from sales leads, customer sign ups, and other inbound marketing efforts makes with the personalized information gleaned from social media. Plus, it appears to offer up a robust mechanism to better target ads through the use of the Radian6 service. 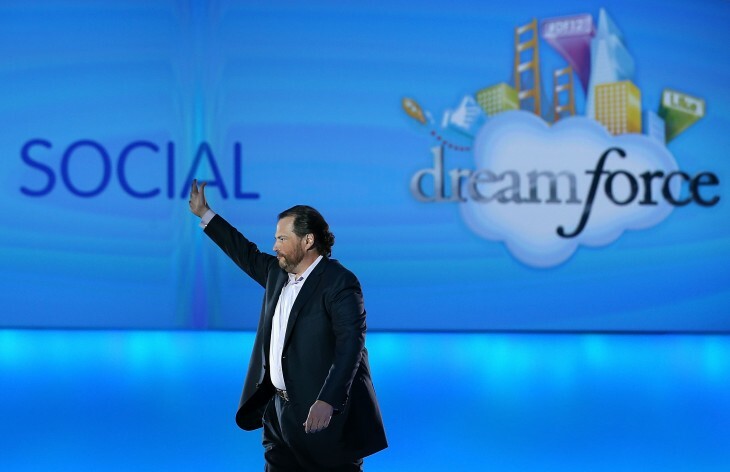 It’s not really surprising that Salesforce is diving deeper into the world of social. After all, the company has placed social as one of its core layers since founder Marc Benioff said that its enterprise social network Chatter would be the primary interface for the platform. Since Salesforce is holistically a customer relationship management service, it makes perfect sense that the company is seeking to help its customers connect with their users. Chatter allows internal teams to talk to one another while also interacting with their community. Social.com will help companies go after their users to help increase their revenue. Today’s move is also another part of Salesforce’s efforts to implement social initiatives it announced at its Cloudforce conference in 2012. The news back then centered around helping to make businesses more social, not only internally, but externally with consumers. According to Salesforce, agencies and businesses like GroupM, Omnicom, WPP Group, and Mindshare have used Social.com to manage more than 500,000 social ad campaigns and 1 trillion impressions. The service is racking up more than 2.5 billion impressions each day.